Hudson Restaurant is located just off Atlantic Avenue in Delray overlooking the eastern side of the Intercoastal. The entrance to the restaurant is located on Venetian Drive and the parking lot is fully dedicated to valet parking. There are four separate eating areas, the bar, the lounge, the deck and a slightly more formal dining area overlooking the kitchen. All but the bar offer a view or a limited view of the waterway. Be advised that the dining area’s proximity to the kitchen was our least favorite as the cooking aromas engulfed the table. Overseeing the kitchen is Executive Chef George Cocilova, a CIA graduate, whose experience includes cooking at Bouley in New York City, The French Laundry in Napa Valley and Aqua in San Francisco. This top-tiered experiencewas evident in my dish, which was perfectly prepared and composed. The table started with the White Flatbread. The crispy rectangular presentation was topped with garlic confit, Fontina and Ricotta cheeses, pinwheel sausage and broccoli rabe. This was delicious. The crust was crispy and was a great canvas for the two cheeses, which gave a good level creaminess. The pungency of the broccoli rabe was offset by a mildly spicy sausage and the garlic confit was a great complement to the other ingredients. For my entrée I ordered the Pork Porterhouse that included sweet potato purée, braised rainbow Swiss chard, HUDSON bourbon peaches, applewood smoked bacon, caramelized onions and finished with a red grape demi. This was outstanding. The pork chop was moist and full of flavor. The caramelized onions were more sautéed than a slow caramelization, and were soft and sweet and the bacon pieces were perfectly crisped and added smokiness and saltiness. The peaches added a great level of sweetness to the overall presentation. This was one great chop. Service was fantastic as well. Our server was knowledgeable, friendly and was more than willing to offer suggestions and opinions. Overall I highly recommend Hudson as a great restaurant with a great view. Mario’s Osteria is located on Glades Road in Boca Raton, just east of I95, sharing feeding duties in a mall with PF Chang’s. The traditional red sauce Italian is mixed with a southern Florida feel. Instead of red-checked table cloths and candles burning in wine bottles, the décor balance hard woods with enormous metal chandeliers. The menu is extensive, with one side comprised of appetizers, sides and pizzas while the reverse side offers Paninis, pastas, meats, fish and chickens. Your traditional selections of parmesans, meatballs, baked pastas are all available. I was told the portions are quite large so I ordered a Veal Parmesan, served with a side of pasta and Marinara sauce. Others ordered the Cavatelli with Chicken Meatballs (to share) and a Shrimp Scampi. My veal arrived and it was breaded, fried, topped with melted cheese and a little Marinara. The pasta was a regular side portion with Marinara. The veal was very overcooked, some bites were incredibly chewy. The flavor of the meat was good and the scant sauce was good, but not great. The pasta was also overcooked, and again the sauce was good. The Shrimp Scampi and the Cavatelli portion were quite large. There was probably 8 ounces of pasta on each, the two chicken meatballs were enormous and there was a tremendous amount of shrimp on that order. Service was outstanding, friendly, helpful and spot on with his checking in. Overall Mario’s is a good choice if you are looking for a decent red sauce restaurant. Dorsia is located on North Federal Highway in Boca Raton just north of Congress on the southbound side. It is a small storefront in a six store strip mall and valet parking is available. Once inside the scenery changes to a well-appointed restaurant with white tablecloths, a bar that seats 10-12 and service that is friendly, brisk and knowledgeable. This is a family run establishment and the care for the customer is felt in the interaction of the hostess (probably the wife) and the chef in each of the dishes. We decided on a single course for dinner and I chose the Squid Ink Linguine with calamari, shrimp, tomato, white wine, and garlic. I was expecting the ring shaped calamari but when it arrived the calamari was presented as juliennes with five medium-large shrimp. While the server was asking others if they required Parmesan cheese I tasted the dish. There was no need to add another component, this was a delicious dish. The house-made pasta was soft and still maintained a delightful bite, the shrimp were sweet and perfectly cooked and the calamari were nicely prepared. The flavors were fantastic. This was a great pasta. For dessert we shared the chocolate mousse pie. Please order this silky wedge of deliciousness. The texture was wonderful. With a cup of espresso, it was the perfect ending to the meal. I highly recommend Dorsia over so many other places in Boca that have glitz over food. This is the best meal I have eaten in Boca and struggle with thinking of a better restaurant in the area. Thank you for proving my point to my relatives that small family owned restaurants prepare food at a different level than the so-called fancy chains. City Fish Market is located on Glades just off and the Florida Turnpike. It shares a common driveway with the Hilton. Valet parking is available. The valet was excellent and very quick both when we arrived and when dinner was completed. I ordered the “New Orleans Seafood Gumbo” for my appetizer. It contained chicken, Andouille sausage with a scoop of Jasmine rice plopped in the center. The portion was more rice than soup, contained a few pieces of chicken and one slice of Andouille. I did see a small piece of okra as well. It was a fairly weak imitation of a great NOLA tradition, which no restaurant in New Orleans would ever serve. For my entrée I ordered the “Atlantic Black Grouper” and for my sides I selected the fresh vegetable medley and the whipped sweet potato. When it arrived I could only stare. There was zero thought behind the presentation. The kitchen slopped some sweet potato purée on a plate, added a few florets of broccoli and cauliflower plus a one inch carrot segment and placed the fish on the empty portion of the pate. It was presented like a bad college cafeteria. The fish was well prepared and maintained its texture. That was the only positive. The sweet potato purée was disgusting, overwhelmed with maple flavor, it was way too sweet and had the texture of baby food. The florets were half-cooked and the carrot segment was barely cooked, more raw than cooked. This was one of the worst prepared fish dishes I have ever eaten. Another member of our party ordered the Lobster Roll. This was an embarrassment to the classic New England dish. There was barely any lobster meat in the roll and the kitchen threw some French fries on the plate. I have seen more care taken at a roadside lobster hut. I ordered the Molten Chocolate Cake for dessert. There is a new standard for the worst recipe and execution. The cake was dry and there was zero molten, there was a hole in the center of the cake. The exterior was coated in sugar and was horrible. My suggestion is throw away the recipe. Overall, the only positives I can say of City Fish is the staff. The valet parkers and our server were outstanding. On the other hand the kitchen staff treated the food and the presentation like a bad roadside diner, giving the impression they just did not care about quality of what they served, throwing undercooked and badly executed recipes on a plate with zero care about the visual. At these prices the quality should be significantly better. My continuous search for great hamburgers in CT brought me to Tautog Tavern in the Black Rock section of Bridgeport. The non-descript exterior displays two large American flags and is American throughout the interior. Entering Tautog Tavern is a throwback to a speakeasy saloons of years past. The wood bar extends the entire length of the right wall with floor to ceiling liquor shelves behind the bar. Above the shelves is an antique harpoon. 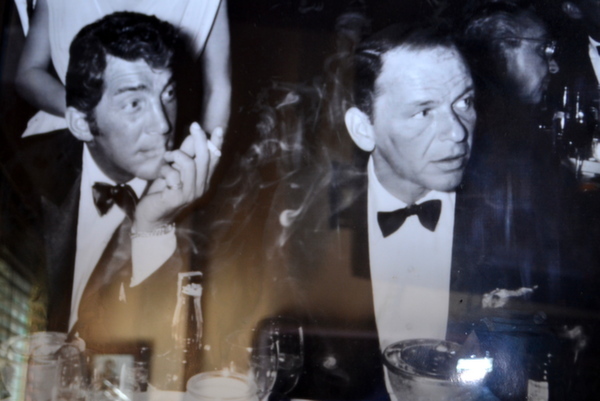 All of these items were brought to Bridgeport from Hoboken, NJ and commemorating this exodus, the owners hung the obligatory photo of Frank Sinatra and Dean Martin overlooking the front of the bar. Photos and maps depicting the rich heritage of Bridgeport adorn the left wall with booths stretching from front to back and a few high top tables in the center. The overall feel is very pubby and very dark. Manning the kitchen are the Carter and Hunter King. You may remember these brothers from the King’s Kitchen at Southport beach where they created some incredibly flavorful lunch specials last year. But I was there for the burger…and I ordered a bacon cheeseburger with fries. When it arrived on a wood slab it was also accompanied by lettuce, tomato, micro-greens and a sampling of house made vegetables. The dish also included ketchup and bacon-jam. 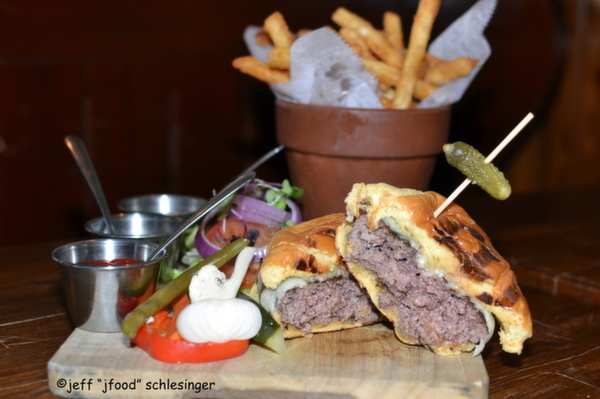 The burger was encased in a toasted Martin potato roll with Vermont white Cheddar cheese melted atop the patty. I was informed that the meat was from Pat LaFrieda of NYC, and my expectations were elevated. The meat was very flavorful, a good blend from LaFrieda. Unfortunately, the grind of the meat was much too fine, delivering a texture more akin to a meatloaf versus a hamburger. The melted cheese was very good, and added a nice creaminess. 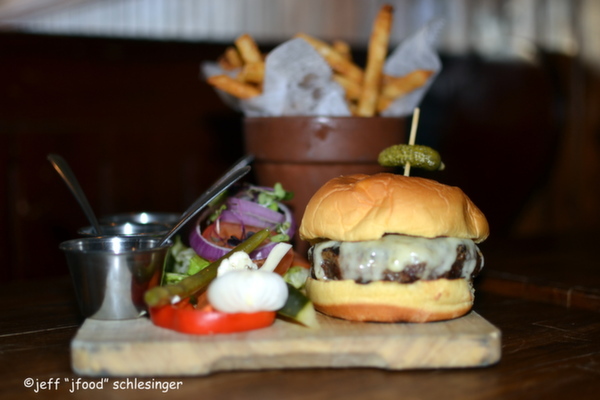 The house-made bacon jam was the star…it was delicious, a great addition to the burger. The bacon was missing. The French fries were frozen pre-packaged, very basic but they were very good, crispy on the exterior and moist inside. 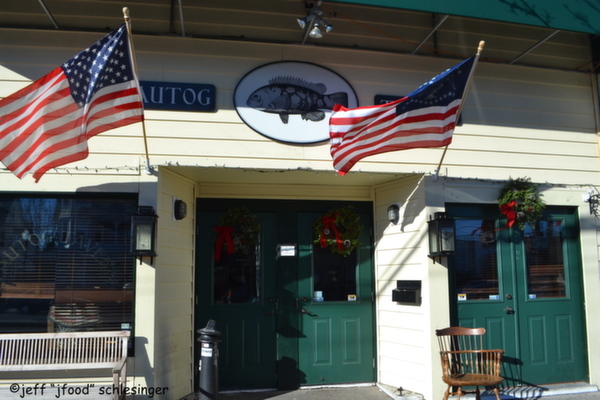 Overall, the burger served at Tautog Tavern was good. I did not like the grind at all and wish the bacon was included,but for $10 it is a very good bar burger.